The Client , a lady, had suffered from Sepsis. This had caused the loss of both hands and both feet. The NHS had provided prosthetic legs and a stair lift had been installed in her house to assist in movement up and down stairs. There remained two short sections of stairway. These had proved difficult for her to manage without assistance from her husband. The local NHS O.T.s had tried to source hand rails but none were suitable for the application. The NHS O.T.s approached Remap and we proposed the use of a gutter style rail into which the Client could place her fore-arm and thus gain support and balance. These were constructed using a standard UVPC rain gutter section. 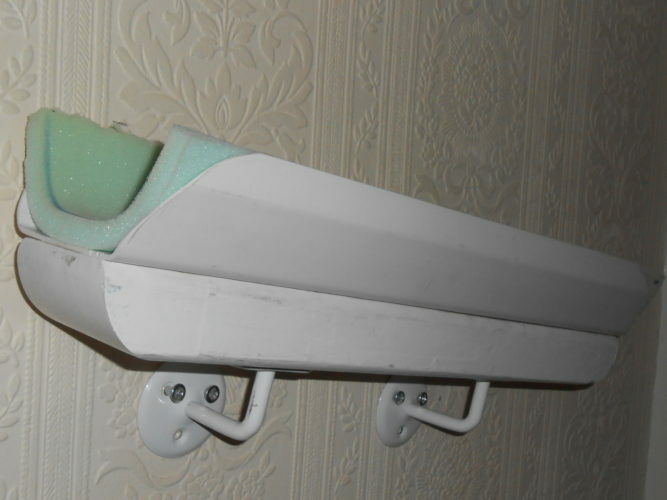 Sections were mounted on a wooden backing piece which was then secured to the staircase walls using standard commercially available handrail brackets. The gutter section was lined with an upholstery foam to provide cushioning and avoid skin abrasions. The location and angling of the rails was determined in consultation with the Client. The Client has now achieved full mobility around the house and is not dependent on the husband for support every time she needs to ascend or descend the stairs. It represented another step to full rehabilitation following her severe illness and she expressed considerable gratitude.